If you bought this year's Halloween decorations from Target, you may want to check out this recall, WSOC reports. 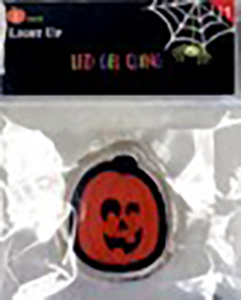 Target is recalling approximately 127,000 Halloween-themed LED gel clings. The gel clings come with two non-replaceable button cell batteries, and are for window use. They light up when you push them. The Consumer Product Safety Commission reported the gel clings can separate and expose the inner decal and LED/button battery compartment, posing choking and button battery ingestion hazards to children. The six different gel cling designs are a green skeleton, pink skeleton, purple spider, black cat, orange pumpkin, and black bat. Model number 234-25-0904 is printed on the packaging. For more information on the recall, contact Target at 800-440-0680 from 7 a.m. to 8 p.m. CT Monday through Sunday, or online at www.Target.com and click on "School/Stationery/Seasonal" on the product recalls page for more information, or the "Product Recalls" tab on Target's Facebook page.